Panasonic AK-HC1800 delivers the highest-quality HD video possible in a compact, multi-purpose camera. Designed for high-end HD video applications including pan-tilt or point-of-view uses, this 2/3″ 2.2-megapixel 3-CCD multipurpose camera produces native 1080i high definition images with extraordinary low light sensitivity (F10 at 2000 lx) and clarity (60dB signal-to-noise ratio; -130dB smear level). In addition to superb resolution and color reproduction, the Panasonic AK-HC1800 camera offers users a host of high-end image controls and functions, including Dynamic Range Stretch and a 12-axis color matrix adjustment for fine adjustment in hue and saturation. 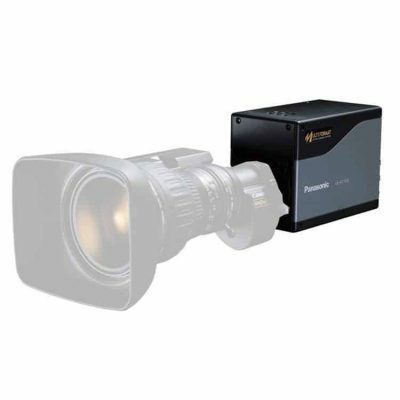 The Panasonic AK-HC1800 is a versatile HD solution for applications ranging from broadcast (news and reality) to weather or traffic reporting (tower-cam), from image magnification (sports, concerts, house of worship) to the unique angles of sports coverage. For flexible integration, the remote-controllable HC1800G is compatible with Panasonic’s comprehensive line of high-performance indoor/outdoor pan-tilt systems. • “Intelligent” functionality provides programmable, unattended automatic adjustment of key image functions (e.g. iris control, gain, and ND filter), ideal for tower-cam and other remote applications. • Also compatible with Fujinon and Canon 2/3rd” HD motor drive lenses, and other 3rd party peripherals and systems from Telemetrics, Autoscript, Telescript, Telecast and more.